Vance Badawey, Member of Parliament Niagara Centre honoured over 70 individuals, organizations and businesses at the Canada 150 Awards for Community Leadership and I was one of them. From the fall of 2015 until January of this year, I had the opportunity to work with 16 other dedicated people in bringing together a year of celebration through the Canada 150th in Welland Committee. Chairing this committee was very interesting in developing relationships with most of the team, many I had never met prior to the committee forming, working with this amazing team to offer the citizens of Welland a year to remember. It was a lot of work, many, many events but also a lot of fun along the way. I learned just how many people in our community were here to make a difference, to make Welland thrive, to ensure all citizens of Welland were included, and how appreciative the community was of our efforts. One and a half years of planning for celebrations throughout all of 2017. We were fortunate to receive a few grants, and through the support of the community, we were able to raise more money through sponsorships and fundraising to provide the best year in free activities Welland has seen. From a $5000 talent show competition, to Canada Day celebrations, to our legacy pieces - this committee was awesome to work with. Our legacy pieces included Trail 150 on Merritt Island in Welland. 150 trees were planted throughout the trail, many purchased by local families and businesses to commemorate loved ones. With left-over funds at the end of the year, the committee also purchased 8 Canada 150 themed park benches that will be placed in various parks throughout Welland this spring. What a year it was. 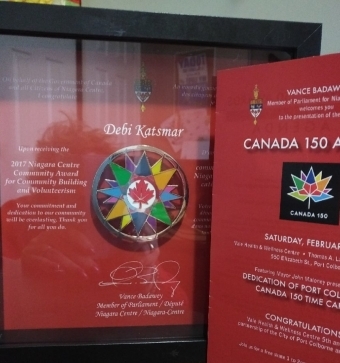 I have to thank Tom Liszt for nominating me to the Canada 150 Awards for my efforts with the Canada 150th committee as well as my on-going support to community throughout the years. Tom was also on the 150th Committee. The team we had were absolutely awesome - each person bringing something to the table and all dedicated to community. This award should have gone to the entire committee. I am humbled to have been recognized for my efforts among so many others in Niagara Centre. While listening to the achievements of the others, I did not feel deserving for the small part I play. There are so many dedicated people in the community. People were recognized for their contributions in time, fundraising, awareness and more. One youth recipient is only 13 years old, and yet her achievements in her short life thus far were absolutely amazing. There were several youth recognized, their achievements fabulous -- I think our future is in good hands if these individuals are an example of our up and coming leaders. I also learned that one person can make a difference when working with others to achieve something for the overall good of the community. I learned the appreciation that is returned from one's efforts in the form of a simple smile on the faces of people at events, to those who take the time to say thank you is overwhelming, knowing that little things make a big difference. I learned that Welland is one fine community! I learned, I love this community, the people, the businesses. I learned I want to stay involved. Maybe even run for council in this year's elections. Wow - did I really say that out loud? Hmmm. So thank you again Tom for the nomination. Thank you to the entire Canada 150th in Welland Committee. Thank you to Vance Badawey for the award. Most of all thank you Welland!